Think of some of your favorite tastes: savory Thanksgiving turkey, buttery mashed potatoes, tangy cranberry sauce, and warmly spiced pumpkin pie. We perceive food's complex, layered flavors through the work of five* types of receptors on our tongues—those that detect either sweet, sour, salty, bitter, and umami (savory). These receptors bind to chemicals in our food and transmit the information about the chemicals to our brains, resulting in a healthy appreciation for the nuances of chocolate, coffee, strawberries, and more. Close your eyes and hold your nose while your friend feeds you a Life Saver® without telling you the flavor. 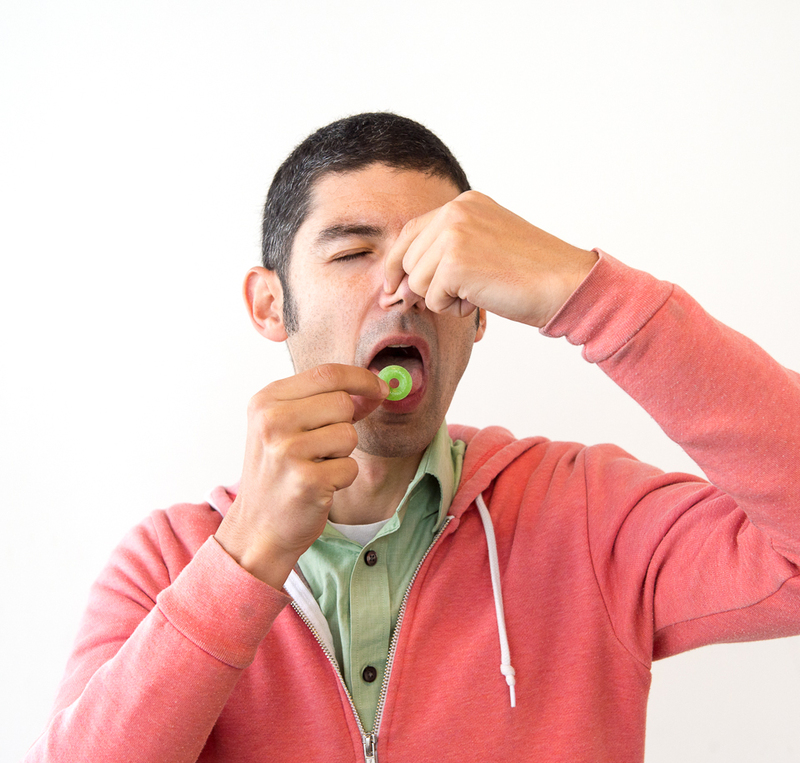 Try to guess what flavor the Life Saver® is without letting go of your nose. Continue to make observations for a minute or so as the candy dissolves in your mouth. Is there any change in the taste of the candy from the beginning to the end of the experiment? Describe the flavors you experience. There are only five confirmed types of true tastes—sour, sweet, salty, bitter, and savory (also known as umami). Scientists are now debating whether there are additional tastes and receptors that detect fat and carbonation (a subset of sour). Each of your different types of receptors binds to a specific structure of a "taste" molecule. For example, sour receptors respond to acids (H+); salt receptors react to the metal ions in salts (such as the Na+ in table salt); umami receptors respond to glutamate molecules; and bitter receptors are triggered by alkaloids. Alkaloids are nitrogen-containing bases with complex ring structures which have significant physiological activity. Some examples of alkaloids are nicotine, quinine, morphine, strychnine, and reserpine. Many poisons are alkaloids, and the presence of receptors for the bitter taste at the back of the tongue may help to trigger the vomiting response. Approximately 80–90% of what we perceive as "taste" is in fact due to our sense of smell (think about how dull food tastes when you have a head cold or a stuffy nose). At the beginning of this experiment you may not be able to tell the specific flavor of the candy beyond a general sensation of sweetness or sourness. Over time, you may notice that as the candy dissolves, you can identify the specific taste. This is because some scent molecules volatilize and travel up to your olfactory organ through a kind of back door—that is, up a passage at the back of your throat and to your nose. Since we can only taste a few different true tastes, it's actually smell that lets us experience the complex, mouth-watering flavors we associate with our favorite foods. *In addition to well-established tastes like salty, sweet and sour, scientists now believe that certain receptors on your tongue bind to long-chain fatty acids, so there may be more than five! The "tongue map" theory of where on the tongue we perceive specific tastes is not how our taste receptors work. All tastebuds contain receptors for all the tastes we perceive. This is true for all tastes except bitter; the back of the tongue is more sensitive to bitter tastes.